One of the questions I get asked the most is how do you calculate poker pot odds? As a result, I decided to write a definitive guide to pot odds, which comes complete with my pot odds cheat sheet. This cheat sheet will make it extremely easy for you to memorize the most common scenarios you will face while playing poker. So without further ado, let’s take a further look at how to calculate poker pot odds. Note: For a complete course on pot odds, implied odds, stack to pot ratio, and equity check out Mastering Poker Math, which is part of the Conscious Poker Membership Program. First and foremost, we must define pot odds: Pot odds are simply the ratio of the amount currently in the pot compared to the amount of money you must pay, in order to make the call. For example, let’s say you are playing in a $1/$3 NL game, and there is $500 in the pot (including the opponent’s wager), and you must pay $250 to call. Your pot odds are $500:$250 or 2:1. If there was $750 in the pot instead of $500, your pot odds would be $750:$250 or 3:1. Pot odds are usually expressed as a ratio; however, I have always calculated pot odds in percentages, because I found it to be easier to understand. Percentages are easier to compare, and it seems more straight forward using percentages. To calculate the percentage, simply take the number representing your share (the right number) and divide it by the sum of both numbers. If your pot odds are 2:1, the percentage would be 1 divided by 2+1, or 1/3 giving you 33% pot odds. You can remember this chart as a shortcut to quickly calculate your odds. You’ll want to use this chart like a multiplication chart (remember those from high school) and commit the most common scenarios to memory so you can easily calculate your pot odds when facing a bet in real time. Once you have calculated your pot odds, you need to figure out your equity, or your chance of winning. On the flop, multiply your outs by four. On the turn, multiply your outs by two. This means that when you have a flush draw (nine outs) with two cards to come, you have a 36% chance of making a flush. With one card to come your equity would be 9 outs x 2 or 18%. Additionally, if you have a backdoor flush draw or a backdoor open-ended straight draw, you can add one additional out for each backdoor draw you have. * If instead of using this formula, you used former one, your equity would be 15×4 = 60%, which is 7% higher than the latter formula. When facing a bet on the flop, there are two situations you may encounter. The first situation is when you know that you will see the turn and the river for the price of the bet you are facing. This happens when you are either all-in to call the bet, or your opponent is all-in with his bet. It may also happen if you’re very likely your opponent will check the turn if you call his bet on the flop (although this is quite hard to predict). In these situations, you can apply the 4x principle to your outs to calculate and use your total equity to confirm that you are getting the correct odds to call the bet. In a scenario in which there is more money behind, and you may have to face another bet on the turn, you cannot use your total hand equity towards making a correct, direct pot odds call on the flop. 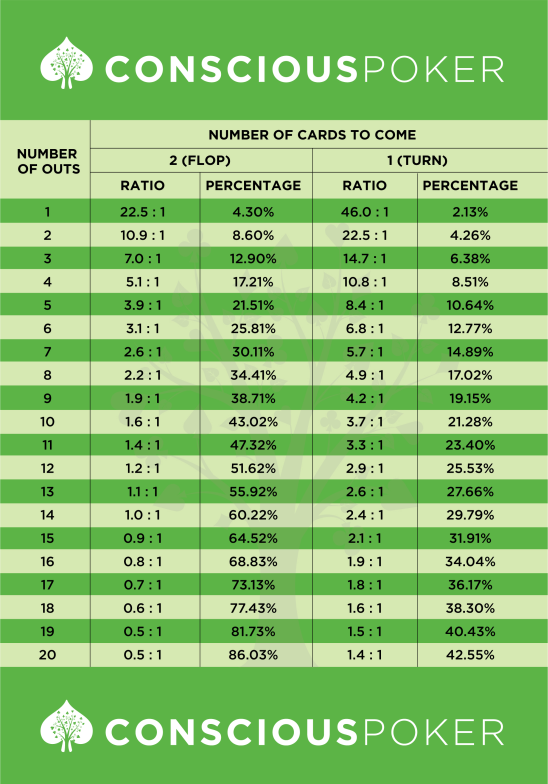 In this situation, you can only 2x your outs to obtain the correct percentage to hit your outs by the turn, based on the assumption that, by calling a bet on the flop, you’re only guaranteeing yourself to see one additional card. For example, let’s say you are playing in a $2/$5 NL game, and you have JcTc in the cutoff. The villain opens in early position to $25, you made the call and go heads up to the flop. You and your opponent both have $200 total at the beginning of the hand (for the sake of easy math, we won’t include the blinds in the pot for this example). With a pot of $50 the flop comes down: 2c 6c 9h, and your opponent bets $25. Assuming your only live outs are clubs (which may not be the case), you need to calculate that you have 9 outs x 2 = 18% chance of making your flush. Thus, you need to call $25 to win $75 (Villain’s bet of $25 plus the $50 which is already in the pot). Hence, you have a 3:1 ratio on your call. Using the quick conversion chart, we know that 3:1 is equivalent to 25% equity. This can be confirmed by adding up the total pot going into the turn, including your call, then taking your call outstanding and dividing it by the total pot ($25 divided by $100, which makes 0.25, or 25%). As you can see, we are not getting the correct pot odds to call, relying solely on the true pot odds, since we only have roughly 20% to hit our flush. Long term, then, we will be losing money in this situation—unless we either have more dead money in the pot already, or we’re able to use implied odds, which we will cover shortly. Let’s take a look at this same situation but facing a check-raise instead. We have JcTc again, but this time it is checked to us on the flop; consequently, we decide to take over the initiative here and semi-bluff our flush draw, betting $25 into the pot of $50. To our surprise, the villain check-raises us to $50. Now the situation is much different. We now have $50 in the existing pot, plus our bet of $25, plus our opponent’s bet of $50. Therefore we have to call $25, to win $125 (50+50+25), so we are getting 5:1 odds, which we know is equivalent to 16.7% equity. We can confirm this by taking our $25 outstanding to call and dividing it by the total pot, including our call going into the river, which is $150 ($25/$150) = 16.7%. Now we are getting the correct, direct pot odds to make the call because we only need 16.7% and we have roughly 20% to hit our flush on the turn! Therefore, we should continue playing our hand. Here’s another example of how pot odds can help you make the right decision on the river. Let’s say you’re playing $2/$5 NL, and you open to $20 in mid position with 99. Your opponent calls on the button, and you go heads up to the flop. The flop comes down: 9c 8c 4s. With a pot of $47, you proceed to bet $30, and your opponent calls. With a pot of $107, on a 2s turn, you bet $70, and your opponent calls again. The river comes a brutal Qc, completing both the flush and straight, so you decide to check. With a pot of roughly $250, your opponent bets $175, and you find yourself in a difficult spot. You need to call $175 to win a total of roughly $600, so you need to quickly divide $175 into $600, which is roughly 30%. (To get that percentage you divide $600 by $175 which is roughly 3.5. Then 1/(3.5+1) = 1.4/5. Since you’ve memorized the charts you know that 1/4.5 is somewhere between 1/4 (25%) and 1/5 (20%), therefore you can round it to 22%. Again, you can use these charts below as a guideline to help you memorize the most common scenarios you will inevitably face. So by running these calculations, you only have to be right 22% of the time to make this a profitable call. You can make the right choice to call or fold based on your hand strength, what you know about your opponent, how likely he is to turn a hand into a bluff and his current mood. For a complete resource on mastering hand reading and correctly putting your opponent on a hand range, check out our Mini Course: Hand Reading Foundation, part of our Membership Program at Conscious Poker. Implied odds are defined as the ratio of the amount of money that is expected to be in the pot by the end of the hand, compared to the amount of money required to call. For example, let’s say we’re playing in a $2/$5 NL game at our local casino. We are heads-up with a super calling-station who never folds his big hands. With $300 effective stacks, we call his early position open of $15 on the button with JsTs. The pot is now $33 heading to the flop, which comes down: 2s 6s 9h. Our opponent bets $50, and we are fairly confident he has a big overpair based on the preflop action and his heavy flop c-bet. We can comfortably assume that if we hit our flush, our opponent will never fold his hand. The first step toward making a profitable decision is to calculate our equity and chance of hitting our hand on the turn (based on the assumption that we will only see one card for free). Using the rule of four and two, we calculate our equity to be 9 outs x 2 (representing one card to come on the turn) and determine it’s 18%. Second, we must calculate our pot odds. With a pot of $83 ($33 + his $50 bet), and facing a bet of $50, we determine our pot odds to be $83:$50 or roughly 1.5:1. Having memorized the charts above, we know we need 40% equity to justify calling. This 40% equity represents your breakeven point, the price at which you can break even on your call. You weigh your breakeven point (40%) against your equity (18%) and realize you’re not getting the right price to call. So you should fold, right? If we included implied odds in this calculation, our true equity would be as follows: We would call his $50 flop bet to win his entire remaining stack of $235 + the pot of $133 = $368. Based on the clear assumption that we will win the remainder of his stack should we make a flush, our pot odds are essentially $368:$50 or roughly 7.5:1. That means we only need to be right 1 out of every 8.5 times to break even, which is roughly 12%. As you can see, our true breakeven point is 12% and since we identified our equity to be 18%, we are getting the right odds to continue to draw to our hand. Keep in mind, however, this is based on the assumption that your opponent has an overpair and that you will be paid off when you hit your flush. Use what you know about your opponent, the situation and the likelihood you will get paid off if you make your hand to determine whether you have implied odds and how great they are. What About Reverse Implied Odds? Reverse implied odds are the opposite of implied odds. With implied odds, you calculate how much money you can win on future streets if you make your hand, but with reverse implied odds, you calculate how much you would lose if you make your hand but your opponent has a better hand. For example, let’s say we are involved in a multi-way pot with 8d7d, and the board is 6h 9h 3s. If the first player to act bets and another player calls, we must now think about whether or not we will have the best hand if we hit our draw. If, for example, the 5h hits the turn, we made our straight but someone might have hit the flush, which crushes our hand. While there are no hard fast rules and every circumstance is unique, a general guideline in spots like these is this: most of the time you will be getting implied odds, not reverse implied odds based on the simple fact that it’s very hard to make a strong hand in No Limit Hold’em. Therefore, when you do make a premium hand, it’s unlikely that you are beat. As a general rule, we can make calls with some reverse implied odds if we are getting a great price on our draw. If the price is not that great, and there are strong probabilities of reverse implied odds, meaning you won’t get paid if you make your hand, or the only action you will get from your hand will be by hands that beat you, consider folding and waiting for a better spot. I hope you liked this blog on how to calculate poker pot odds, implied odds and reverse implied odds. To fast track your results and to master this subject completely, be sure to check our Mini Course: Mastering Poker Math, part of our Membership Program at Conscious Poker. For another great resource on how to calculate poker pot odds, check out this awesome blog by 888 Poker.